When Manchester based Murkage released their first single back at the start of this month, the response from the public was incredible. With heavy coverage from a wide range of sites, it soon became apparent that Manchester had unleashed a whole new beast on the music industry. The energy and angst that the Murkage boys brought to the table is something that hasn't been seen for a fair few years in the UK, especially in Manchester, and the single has been supported heavily by the UK's largest radio station, Radio 1, championed by DJ's such as Zane Lowe and Huw Stephens. Today we have the exclusive stream of one of the remixes available as part of the single packages, from new kids on the block Lungs. The duo comprise of two producers who live on opposite sides of the world, with one based in Newcastle, England whilst the other resides in Dubai. It may appear a little strange to ask a production duo who are relatively new on the scene to remix your track, but as Murkage Dave puts it so simply, "we went to them to get a remix because we knew they would keep it 100% TRILL". Trill is what they wanted, and trill is what they got with the bass heavy trap influenced remix that features some Houston-style pitched down vocals, with a distinct chopped not slopped feel about the whole track, with synth stabs and spacey beeps covering the shuffling hi hats and deep kicks. 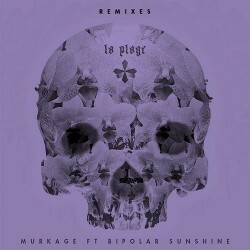 The Lungs remix of "La Plage" is part of the complete single package which also feature dope remixes from the likes of Ahadadream and Coporal F, all of which can be purchased from iTunes. If you're on Spotify, you can also stream the remixes from here, and if you haven't already checked out the invigorating visuals for "La Plage", then peep them below. Bass · Electronic · Exclusive · Hip-Hop · U.K.
Is this the nightmare before Christmas…. ?